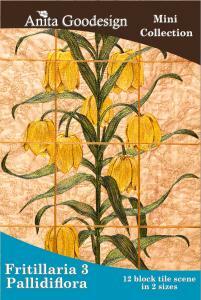 Fritillaria 3 is the third release of a 4 part series of mini collection tile scenes. This particular release is the "Pallidiflora" flower. This species of Fritillaria is very winter hardy, since it is native to Siberia. It has strong, wiry stems and the leaves are arranged in whorls with five to nine flowers per stem. The flower is big, yellow, and bell- shaped. This species is cultivated in NE China, and the bulbs are used medicinally. This is a beautiful tile scene when embroidered and mimics a piece of artwork. The detail and depth of digitizing is phenomenal. 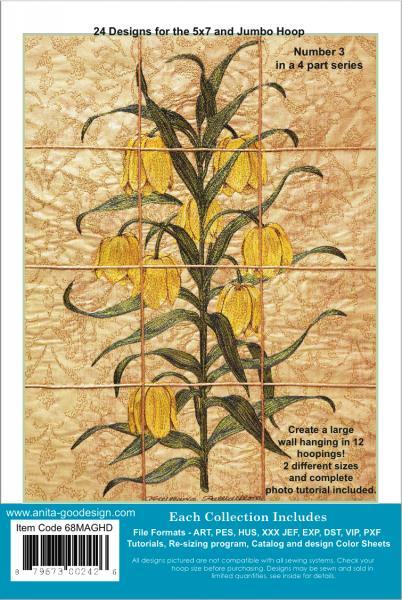 Don't miss out on this series and collect all four of these beautiful "Fritillaria" collections.